Day 6 of #scrypthalloween looks at my short story spinoff IN CASE OF WEREWOLF. This was the third graphic novel that @dpipito and I coordinated with 10 artists, and it is now in text form as well. We had some very professional artists for the comic version, and the stories within were written as ones you’d tell around a campfire…. official description: Do your bones ache? Does your instinct sometimes prevail over rational thought? When night descends, do you feel “different”? If any of these are your symptoms, then you are not alone. You may have contracted lycanthropy, and when the moon rises, your inner beast will emerge. This short story is a spinoff of the novel “Bones At Breakfast” and is available at lulu.com in print or as part of the Eden’s Order Trilogy at Amazon or Barnes and Noble. Day 3 of #scrypthalloween takes a look at my #novel BLOOD, THE SECOND HELPING. 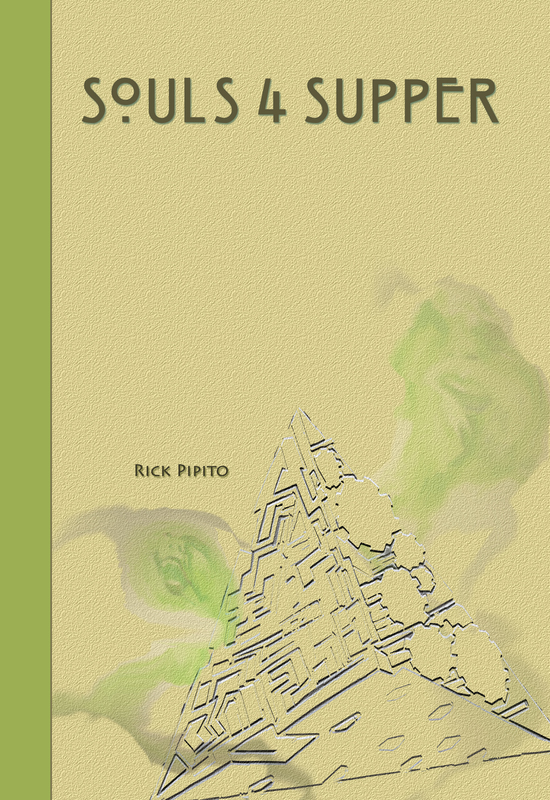 The cover art here (sans text) by @dpipito hides some of the plot in its colors. This was originally planned as a sequel to another book idea, but after the success of F&L it made more sense to do a #vampire #book. My villain Cain is a many fan favorite, as well as how I incorporated real historical events into the narrative. It’s available in print and digital forms at Lulu.com and Amazon, as well… as part of the Eden’s Order trilogy at those markets and Barnes and Noble. ……. official description: Gordon Lightcap and his group of unique specialists race against time to stop the coming apocalypse. Cain, the world’s first vampire, and his House of Twelve, have waited an eternity to put this world changing plan into motion. At the center of these two sides is one woman with two identities. Her human persona of Moira Donatelli, has left clues to assist Gordon in his quest, while her vampire identity, Lilith the Deceiver, has helped Cain back to power. Both men must fight for their survival as well as the woman they love. Season 1 of Ash vs Evil Dead was a great throwback to the Evil Dead/Army of Darkness franchise. It cemented itself as the perfect installment for fans of old and new. I thought season 2 would have been more of the same approach, but I was thankfully wrong. Sure there was some of the B movie humor, which had me laughing hysterically at one point (The Morgue scene when Ash is going after the book). But there was also some sincerity to it in a very Evil Dead 1 sort of way. When Ash is in the asylum it is downright creepy. Baal vs Ash in a mental battle was fun to watch. Ruby joining the team was a step in the right direction of adding tension and mistrust. Pablo becoming the book was interesting. Lee Majors as Brock (Ash’s father) was perfect casting, and it made me miss his old 6 million dollar man days. Then they took a completely unexpected turn and went back to prevent the events in the first movie from ever happening, only to change them for the worse. My question is who picked up the Necronomicon in the post credits scene? If the writers wanted to really throw the viewers for a loop they would make it one of the kids from the remake a few years back. In that movie Ash shows up to pick up the surviving girl. With that epilogue and him in the shadows there, it could easily be explained that he brought her in as a new team member. This would make that movie canon. Even if it was not a good interpretation it would still fit in what could become an even more exciting series. I mean there really isn’t anything I can complain about here. If B-movie horror/comedy isn’t your thing, then you won’t like this, but for any fan of the original films I highly recommend it. I give it 4.5 out of 5 sCrypt ratings. What did you think of Ash vs Evil Dead season 2? The Alien franchise has been a favorite of mine since I was a kid. Each installment has me on the edge of my seat waiting for release. Well I finally got to sit down and watch Alien: Covenant, and found it to be familiar, yet refreshing. At first I found myself confused thinking that they wouldn’t even touch on the events in Prometheus, but thankfully they wrapped up that story fairly well, and in a shocking way. It explains a lot for the rest of the series. The twist with David and Walter at the end however was slightly predictable. I saw it coming a mile away. The whole premise to the crew going to the planet that Prometheus had been on was a little far fetched. You would think for a technologically advanced crew of astronauts, that there’d be some sort of record of what happened to the crew of Prometheus or at least where they were going. There were also a few places where the CGI seemed off to me, but not terrible. I’m just used to the original films where the effects were all practical. That was the only real faults I found with the movie. On the positive side, Michael Fassbender is becoming one of my favorite actors. His dual roles in this movie were spectacular, and Katherine Waterson’s female lead was as likeable as Sigourney Weaver’s Ripley. The high points for me were the explanation of where the Aliens came from and how they were engineered. They aren’t yet the species we meet in the first Alien movie. They are something else, but by the end of the movie we see where it is going to lead. I’ll admit that the white colored alien was downright eerie to see. It gave me the creeps. One thing that I really like is that this is definitely NOT the movie that takes place right before Alien. There obviously has to be another film to explain more. While it answered quite a few questions, it opened the door for more lore. I still would like to see one more adventure for Ellen Ripley, but if I can’t get that this is just as good. Overall I give it 3.5 out of 5 stars. It’s be no means a spectacular film, but has an important place in the franchise. It was fun, and you could feel the mortality of the characters involved. What did you think of Alien Covenant? To celebrate this time of Holiday giving, I’m doing a 12 Days of Christmas Giveaway. Each day from the 14th through the 24th I will be selecting one winner to receive a free digital copy of one of my books. On Christmas day, I will select one winner to receive a free autographed print copy of one of my books. Its very simple to enter. First, select the title that most interests you (If you are chosen as a winner, this is the book you will receive). Once you select the title, you will use the hashtag mentioned next to it in your post. Please share this info with as many people as you can, and don’t hesitate in entering. If you have any questions feel free to ask. You can keep entering from now through the 25th of December 2014, so good luck. Wishing a very Merry Christmas and Happy Holidays to you all! There are only a few days left until Halloween, so I felt it was time to do a little giveaway. I’m giving 1 copy of my novel SOULS 4 SUPPER to 1 lucky winner, and it will be personally signed and addressed to whomever you designate. 1) Follow me on Twitter @rickpipito and retweet this post (tagging me in it). 2) Follow me on Instagram @rickpipito and either screen grab or regram this entry tagging me in it. 3) Share this link from my facebook page http://www.facebook.com/fleshandleftovers. 4) Reblog this contest on your own site or blog and make sure to tag this link in it. Each of the above will earn you 1 entry into the drawing. If you do all four, you’ve quadrupled your chances. The drawing winner will be selected at midnight on Halloween night (Oct 31, 2014). If you have any questions, please feel free to inbox me rickpipito@hotmail.com or comment below. NO, IT’S NOT. YES, IT IS: URBAN LEGENDS: Following the format of the argument book I did, this will share personal experiences and humor to address whether urban legends are real or not. It will take a look at these stories and present facts for and against it. Then you decide if it is real or not. A LITTLE GIRL IN THE LAND OF THE HICCUPS: slated to be released on Black Friday of 2014, this children’s book illustrated by Dan Pipito in his amazing watercolor style, follows the adventures of a girl who must rescue a village from the annoying creatures known as the Hiccups. 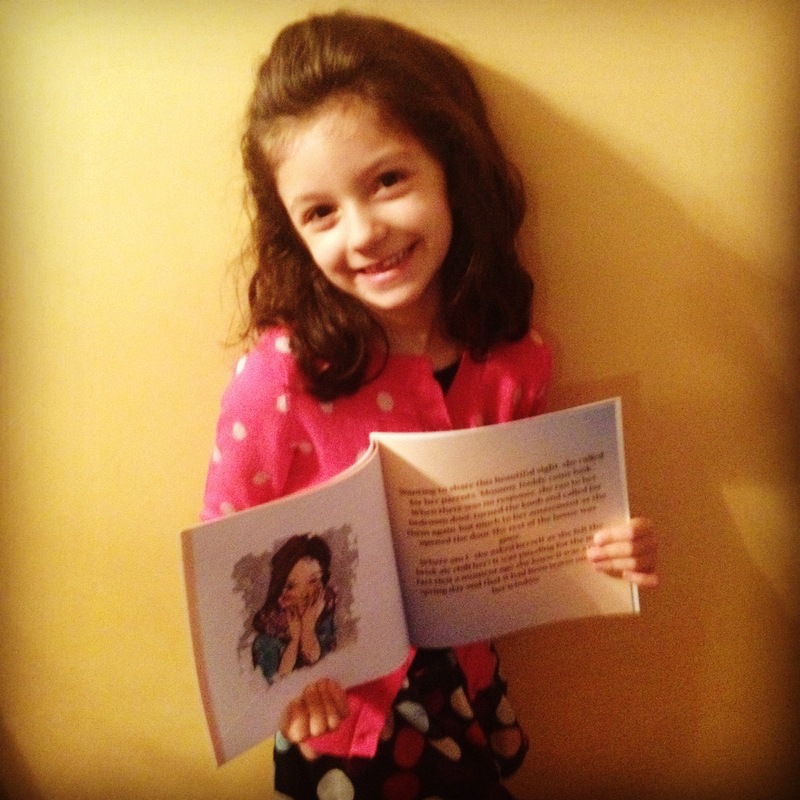 UNTITLED children’s book: The little girl and boy get lost on a new adventure. DEMONIC ENTITIES: This graphic spinoff of the novel DEVIL’S DESSERT focuses on what happened to the demons after the events in the novel. FINAL UPGRADE: This graphic spinoff of the novel TECHNO FEAST shows more of what happens all over the globe during the events of the novel. There are other projects on the board, but at this time I can’t reveal much about them due to copyrights. Stay tuned. I figured since it is getting closer to Halloween, I should make a quick list of the current publications I have and a brief idea as to the summary of them. FLESH AND LEFTOVERS: While zombie incidents plague the world, the survivors must unite to prepare for a much bigger threat. BLOOD, THE SECOND HELPING: Vampires have been a thing of legend, but throughout history they’ve played an important role. Now a team of humans who have survived horrific incidents must seek out the vampire lord and destroy his clan. BONES AT BREAKFAST: A sinister villain has evolved into a creature beyond imagination. With his army of werewolf servants and allies, he will attempt to reshape the world in his image. SOULS 4 SUPPER: The ghosts of countless people roam free in a desperate move toward the afterlife. Can a small group of covert operatives surpass them to prevent the opening of Pandora’s Box? DEVIL’S DESSERT: Hell’s demons have chosen earth as their final battlefield against the forces of heaven. With humanity caught in the center of this eternal war, they will have to choose their own path toward survival or face extinction. TECHNO FEAST: A supercomputer has evolved and taken control of all networked technology. With the world at its command, humanity must find a way to combat the threat, by seeking out answers that have been hidden from the public eye. NO, IT’S NOT. YES, IT IS: ARGUMENTS: A lighthearted look at arguing through personal experience will give you a few laughs, might teach you a thing or two, and help better your approach when disagreeing with someone. At the very least, you will know how to deal with certain personalities. ZOMBIE INCIDENTS: spinoff filling in back story of events in Flesh and Leftovers. LEGENDS OF VAMPIRE: spinoff building on the world of Blood, The Second Helping. IN CASE OF WEREWOLF: spinoff of events in Bones At Breakfast. 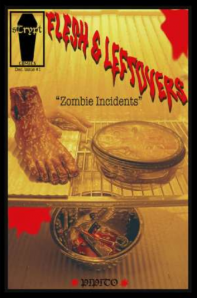 EDEN’S ORDER TRILOGY: Collects Flesh and Leftovers, Blood the Second Helping, & Bones and Breakfast, as well as novelized versions of Zombie Incidents, Legends of Vampire, In Case of Werewolf and bonus material. PANDORA’S CHAOS TRILOGY: Collects Souls 4 Supper, Devil’s Dessert, & Techno Feast, as well as novelized versions of In Case Of Werewolf, Demonic Entities, Final Upgrade, and bonus material. All of the above listed are available for purchase in multiple formats through the links on the right of this page. The question has been asked of me time and again, “Did you use the food related theme for your book titles because of your close food connection?” Honestly, no. It is ironic that it worked out that way, but when I had the concept for the first book I was dying to find a catchy title. One day as I was sitting there brainstorming with martini in hand, I thought about what zombies eat. Flesh was the obvious answer, but that wasn’t catchy or creative enough on its own. Then I thought, well if they eat meat what about the leftovers of the carcass? The title came from that. Then when I decided that this was going to be part of a series, I went with similar thinking. What does the main threat consume and how can I tie it into a different type of dining experience? I didn’t want to do “Flesh and leftovers 2” because even with a subtitle that wouldn’t be accurate. “Blood, The Second Helping” would have the sequel number in it AND still meet the title criteria I set. The only other number at this point is in book 4, so “Souls 4 Supper” worked, and so on. I find that it becomes increasingly difficult with each new title to come up with something equally fun and catchy without feeling forced. So far there are 6 books with 3 more planned in the main series. With the comic book spinoffs, I focused on subtitles being the defining part, and used the name of the “chapters” (ala incidents for the first one) and the threat focused upon. 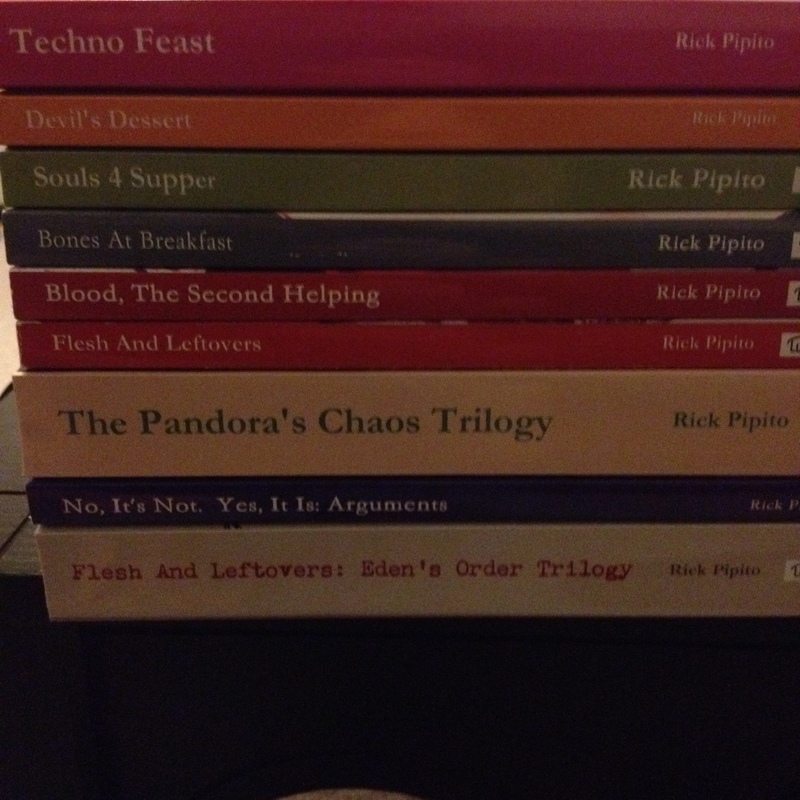 All 9 novels (plus the bookend mentioned in my prior article) will be a grand feast, so stay tuned. As far as my aforementioned food connection? Well, she does inspire me to write with amazing food and drink, so in a way that inspiration alone goes hand in hand.